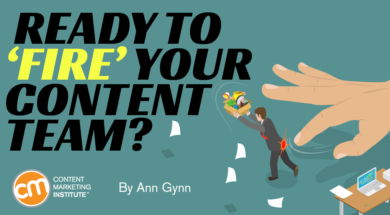 Ready to ‘Fire’ Your Content Team? Have you ever had one of those days where you wish you could start your content marketing team over? One of those days when you want to fire everybody, figure out what you really need, and then hire (or rehire) as needed? That moment of frustration likely ended quickly because you knew firing your content team wasn’t an option and probably wasn’t the best solution. But don’t ignore the thought and just push past the pain. Take that negative thought as a signal you need to reflect on why you’re feeling that way – to identify what isn’t working and what practical solutions may be possible. Here are a few questions and tips to help guide you through that process. Before you look at the team or the individuals, assess whether your content marketing program is set up for success. Your team needs to work from a strong foundation to have any chance of achievement. 1. Do you have a documented content marketing strategy? Your strategy is essential to ensuring that your team is operating from the same page. Your strategy should communicate all the relevant elements your team needs to know – purpose, goals, audience, style guide, metrics, etc. 2. Do you have buy-in from company leadership, including executives in interconnected departments? Operating the content marketing team in a silo is a recipe for frustration. If your organization as a whole as well as individual departments (especially sales) haven’t bought in or worse, don’t even know about the content marketing strategy, you must bring them into the conversation. 3. Have all team members been informed of the strategy? If you have the foundational document, you must deliberately distribute it to the content marketing team. This is not a one-time activity. You should regularly refer to it and be explicit about how the team’s work relates to it. TIP: Create a one-page version of your strategy for team members to post at their desk as a visual reminder. If it’s the team …. If you have a good foundation that all team members know and use, then the problem may relate to the role(s) on the team. It’s time to re-evaluate what your team does and how it operates. 1. What is the purpose of your content marketing team? If the team’s sole purpose is to implement the content marketing strategy, then this is an easy question to answer. If, however, your team has responsibilities outside of content marketing, assess how resources are divided among those responsibilities. If the other stuff consumes too much of your team’s time, evaluate alternatives (reassign duties that don’t relate to content marketing or reassess your content marketing strategy goals to better fit available resources). 2. What do the team members do? 3. How do the roles align with the goals? Review the content marketing team’s purpose, goals, and success measures against the descriptions of what team members do. Are they aligned? If not, what can you adjust? Should you revise the day-to-day activities or do you need to update your content marketing strategy? TIP: Manage the expectations for each role by connecting its success to the overall strategy success measurements. For example, a writer should know how well the calls to action he crafts convert to e-newsletter subscribers. 4. How does each role operate within your workflow? If every role is aligned with the strategy, and you still have pain points, look to your workflow. Document the general steps from content idea through publication, promotion, and measurement. Then list every role involved in each step. Are there steps that involve too many roles or people? Are there steps that do not have enough roles assigned to them? If you think a step is understaffed or overstaffed, adjust your team structure to maximize the collective effort. If you’re comfortable that the content marketing team is well structured, then the frustration could relate to individuals on the team. 1. Does this person clearly understand what is expected of him or her on a day-to-day and long-term basis? Review your onboarding process to see how this person was introduced to her responsibilities. Is there a detailed job description? Are daily, weekly, quarterly expectations documented – and, more importantly, shared with each team member? Does this individual receive creative briefs explaining the salient points for each project? Ensure that your team members fully understand what’s expected from them and how their work fits into the overall production process. For example, Betty may see on the content calendar that her blog post isn’t running for two weeks so she doesn’t see turning it in a day late as a big problem. But once Betty learns that a missed deadline means her editor has to rush through two articles the next day and forces the graphic designer to work longer the next day to create the cover image, she appreciates the value of her deadline and takes steps to ensure that she doesn’t miss it again. TIP: If someone was promoted internally to their position on the content marketing team, make sure they’re onboarded to the role. 2. Have you made this person aware they are not meeting expectations? Do you regularly communicate with the person? Are you addressing expectations in those conversations, especially when those expectations aren’t met? Annual performance reviews are one step above useless in this category. Dumping a list of must-fix items on a person once a year usually won’t result in significant improvement. And it allows their mistakes to build over 12 months. Meet individually with your team members with regular frequency – at least once a month. Discuss their progress, identify their concerns, and review how well they’re meeting expectations. Address problems as soon as they arise. If the problems continue, create a six-month personal improvement plan that details exactly what the individual needs to do to correct the problems. Establish monthly, three-month, and six-month goals. Set time each week for a formal review to assess progress. TIP: Never say someone has the wrong or bad “attitude.” You can’t change what a person is thinking or feeling. Be specific about the behavior the person needs to change. 3. Does this person need additional training? Content marketing teams are fairly new creations by enterprise brands. Often, they were formed with members of existing marketing staff. Perhaps the person shifted into a content team position and wasn’t properly prepared for the role. Or maybe the person hasn’t been able to keep up with evolving technology well enough to do the job well. Identify opportunities for this person to expand his or her knowledge to obtain the necessary skills to do the job well. Is there an intensive workshop on the topic? Are there a series of webinars available on the subject? Is there someone on the team who could act as a coach to help train this person? TIP: It’s usually worth the time and resources to invest in a current employee who simply lacks the knowledge rather than firing that person and searching for a new one. 4. How can I fire this person? Sometimes a person isn’t a good fit for the role or the company. If you’ve exhausted the previously discussed avenues to improvement, sometimes the only solution is dismissing the person. Talk to your HR department well in advance to see what the formal process is. Remember, the way you fire someone doesn’t just matter to the person being let go but to all the team members. Be professional and respectful when you dismiss the person. The next time you grow frustrated with your content marketing team, refrain from throwing your hands up in the air. Take a deep breath. Schedule an hour on your calendar. At the appointed time, ask the hard questions, starting with, “Is it the person or the role?” From there, take the necessary steps along the path to finding a workable solution. To help your content marketing team members expand their skills – and improve your organization’s content marketing success – bring them to Cleveland this September for the world’s largest content marketing education event. Register now for the best savings for Content Marketing World.